My baby cake - I enjoyed this one so much, even got a little broody lol! I worked so slowly with it - as if handling a real baby. I'm pretty sure this cake drew the most attention out of them all. I simply loved the response. I must admit it is super rewarding when I get the "oooooohs" and "aaaaaaahs" *BIG SMILES* I feel affirmed in my handywork, especially when I feel as if I'm going out of my comfort zone. This baby's body can be made in a different colour and would automatically look like a babygro. I wanted to make the bare bum for fun and laughs. I added the limbs, face and wrinkles using my modelling tools. Watch this space for more cakes with 3D figurines. Forthcoming attraction: Tinkerbell. nearly there: sleeping baby with wrinkly skin. The end...finally he gets his blankies. Best of all, my 13 year old son made this teddy bear - his first ever attempt at an edible 3D figurine. So very proud of him! He talks of being a chef one day - I'm sure he'll change his mind a few times yet, but for now, he is still doing well in the kitchen, and especially as my apprentice. LOL! I should have taken a pic of the orginal shoe, but this is what I cut off a perfectly good sandal to make my stiletto heel. Ofcourse the shoe has never been worn! 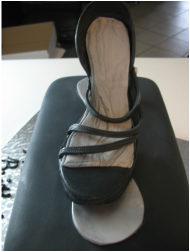 I gather samples that dealers are no longer using so I can use the shoe base where my fondant sole will rest over the two-week period that it has to harden. Still it is painful cutting up beautiful shoes! 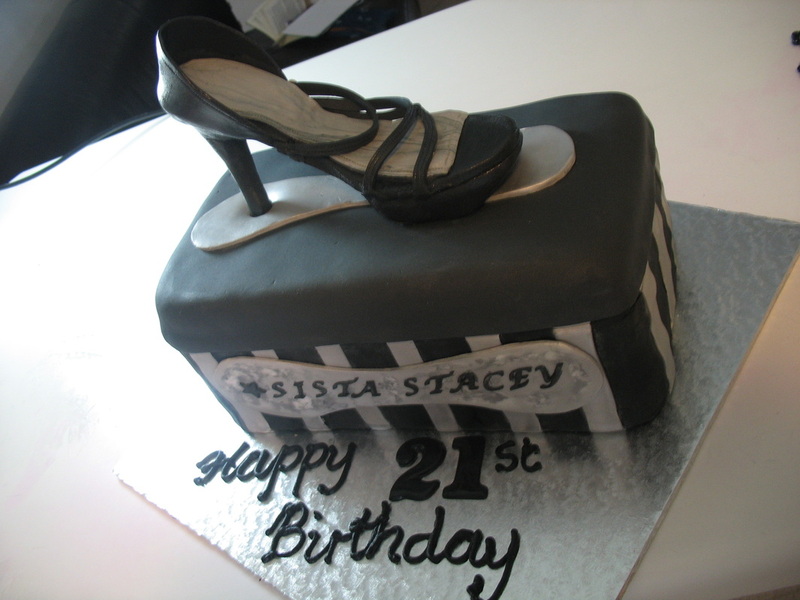 This shoe and stacked shoe box cake is due for 21 July but I have concerns about it not curing in time in this cold wet winter weather. I will post more on my shoe as I work on the other parts in the next few days. I started by cutting a template out of cardboard and then used it to cut out the fondant sole, which will now be left to harden on my shoe mould. 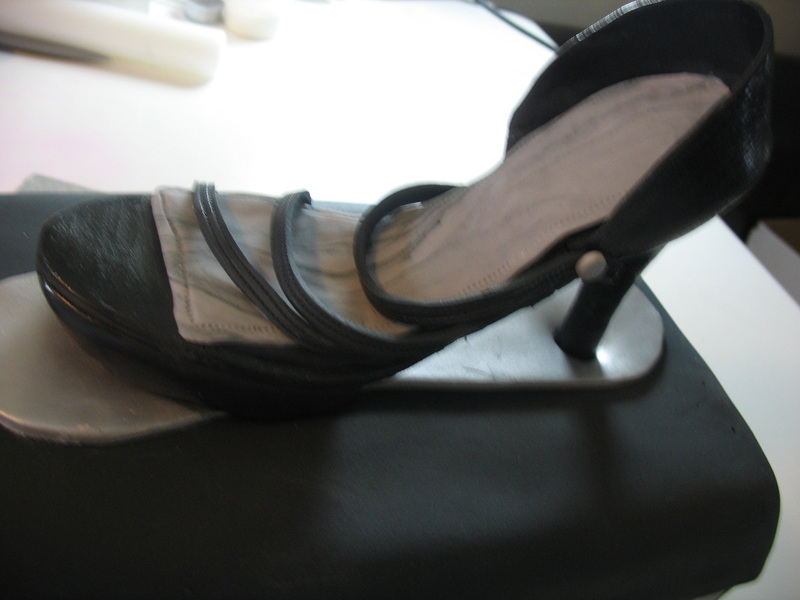 I took my time moulding the heel. It is actually higher and slimmer than in this pic. The client wants it quite high so I'll make a platform under the ball of the foot to level it with the heel. These pics were taken on Friday, 29 June, 3 weeks to go. Short of proper shape cutters, I sometimes have to improvise and use my own techniques to attain the shapes I need. For these mini corsets I used a heart and circular cutter. After rolling out my fondant evenly, I use my cutters to shape the corset, then I use marbles to shape the breasts, leaving them in until the fondant is hard enough to support itself. This photo doesn't show it, but corset was finished with a silver ball between the breasts. I love that quote. It makes my rewards all the sweeter when I achieve what I set out to in terms of moulding and shaping my work. Shaping and coaxing the little buttons on my remote control cookies was easy, but the double buttons were quite a challenge. I eventually did my own thing. Although I wasnt entirely happy with the result, it worked overall. So these were my popular Father's Day cookies. The original idea I found on the internet and decided it was a good one to mimic. Boxed with a label that read, "ok Dad, you can have the remote". Another cute and successful outcome.